To the rest of the world the land Down Under is known as the home to some of the most deadly animals on Earth. Luckily with minimal killings in recent years and the availability of anti-venom to those attacked, the Australian Outback is less of a risk. Yet your best defence for safety and survival is to have common sense and be prepared, by knowing the potential dangers. Arm yourself with preventative measures so that you know what to do in any potential situation. So what makes the Outback so dangerous? The behaviour of wild animals is unpredictable but very often they are more afraid of you than you are of them. Generally speaking, a nasty attack by wildlife can be avoided if they are not harassed, but left alone. Always carry a torch when there is low visibility, as most animal attacks occur at night. Painful and poisonous bites can infect you with venom and harmful bacteria. Many attacks need stitches and hospital treatment. 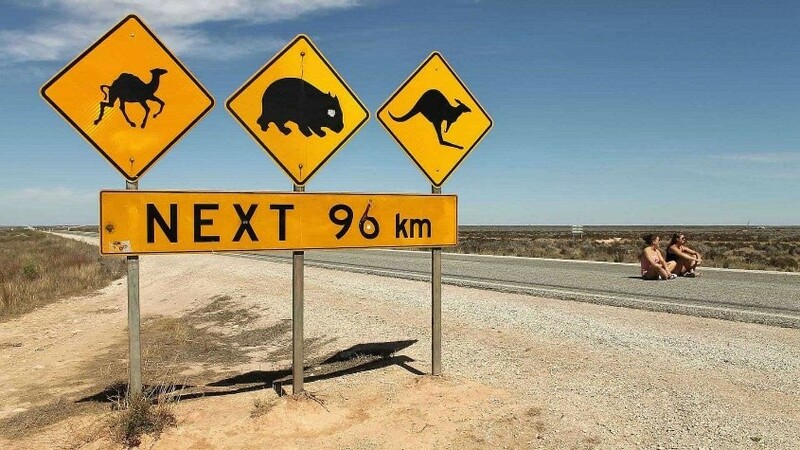 But beware of Mad Outback killers…. 2018 sees the release of , ‘Dundee’, a spin-off of the Crocodile Dundee franchise. 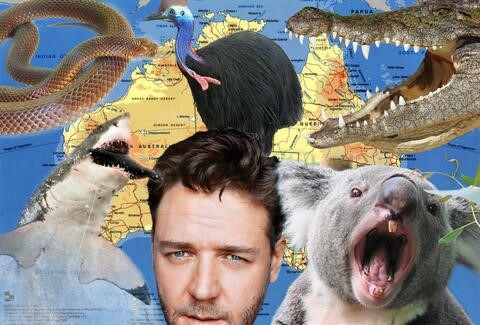 Russell Crowe says that Dundee is going to learn who the most dangerous animal in Australia is! Check out the trailer below. Snakes are the top fear of Outback travellers, yet the vibrations of your feet walking on the ground will cause the snakes to slither off long before you reach them. Snakes bite purely in defence. 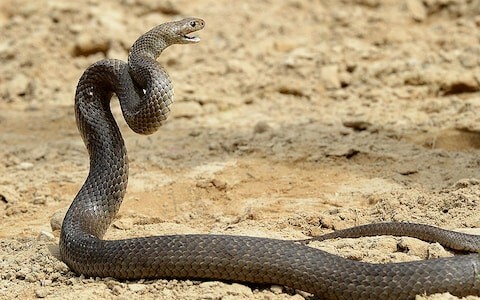 The best way to react if you see one, is to simply freeze, as sudden movements cause the snake to panic and it will be more likely to bite you. So even though Australian snakes are the most dangerous in the world, they will not bite as long as you leave them alone. So give it chance to flee and just back away. If there are two of you, get the person furthest away from the snake’s reach, to throw something in a different direction to distract it. The best way to tell if a snake is venomous is to identify the snake. Any brown snake, king brown or western brown can be greenish, grey, golden, copper or olive in colour. The deadly tiger snakes are variable in colour and often banded like those on a tiger. Also even though a python is not venomous it can still bite. Juvenile snakes can also vary a lot from their adult colour. As it is often difficult to identify snakes from a picture a visit to a wildlife park to take a good look at snakes before your trip would be advised. Go to http://members.iinet.net.au/~bush/ID_index.htm to look and identify some Australian Snakes. The more snakes you see the easier it will be to spot the characteristics and differences. • Treat all snakes with respect and common sense. • Wear solid shoes when bushwalking and avoid long grass. • Use a torch at night and do not reach into dark corners where a snake might be hiding for cover. There are two kinds in the Australian outback, saltwater crocodiles and freshwater crocodiles. They live in northern Australia and are most aggressive during their breeding season in September to May. Saltwater Crocodiles live in the far north of Australia and are very dangerous. They are huge, smart, mean, cunning and unpredictable. Their size and strength is not exaggerated and attacks happen on a regular basis. Most attacks are on livestock or pets but there are regular accidents involving humans and they have been responsible for several fatal accidents in recent years. 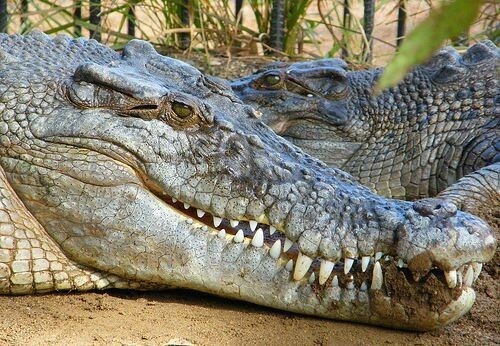 Freshwater crocodiles are shy fish eaters and will not bother you unless you bother them. Never the less they do have a lot of sharp teeth so best not to harass them. Plenty of people do live up in the northern parts of Australia so with a bit of common sense you can avoid getting eaten! • When in the outback do not assume it is safe to swim, stay away from deep, still, muddy water. In these places keep well back from the water’s edge. Waterfalls, rock pools and small creeks may be fine but ask locals, or the nearest tourist information centre, for assurance. • Australian saltwater crocodiles can jump and attack so always face the water and avoid standing on any overhanging logs. • Avoid places where cattle or native animals drink. • Never return to the same water’s edge at the same time, because the next day they will be waiting! This spider is one of the three most dangerous spiders in the world and regarded by some to be the most dangerous. Funnel web spiders are 1cm-5cm in body length. They are dark-coloured, ranging from black to blue-black to plum to brown with a glossy hairless shield covering the front part of the body. If bitten apply a bandage and put firm pressure over bite to prevent venom spreading. Seek medical attention. The Redback spider is a member of the black widow family and looks similar, but is set apart by the dorsal red stripe on its back. They live in dry and dark places. It is the female redback spider who bites if touched and are not usually aggressive. They have a body about the size of a large pea with slender legs. Their jaws are very small but many bites are very painful and can kill children and the elderly. If bitten, do not apply a constrictive bandage, administer ice packs to the bite and seek medical attention immediately. • Be careful when handling your things in dark corners. • Always wear gloves when collecting firewood, moving rocks and wood. • Cover your boots at night. 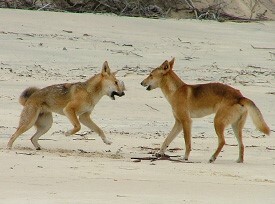 Dingoes are members of the wolves, jackals, foxes, coyote and dog family. These eye-catching, wolf-like canines are potentially dangerous to humans and are capable of killing people. They often approach humans because they are naturally curious and have bitten humans, occasionally quite severely. Noise and cooking smells can attract dingoes. They have also been known to dig up human bush toilet waste! They can move quickly and have been known to circle, lunge and chase. They tear tents and steal property. They can nip, bite or worse. Just as a domestic dog can attack humans, so do the dingoes. They should be treated with absolute caution as they are wild unpredictable animals. • Never approach a Dingo and avoid feeding Dingoes. • Keep your campsite clean and secure food, bait and rubbish. • Never try to pull food away from a Dingo. • Avoid jogging or running as it can attract and excite Dingo attention, triggering negative interaction. • Stay in small groups as people walking alone have been threatened and nipped by Dingoes. • If you feel threatened, stand up to your full height, face the Dingo, fold your arms and keep eye contact, calmly backing away. Do not run waving your arms! The giant centipede is able to grow to nearly 18cms in size! The centipedes have large crescent-shaped pincers and have a blade-like inner edge they use to inject venom. These claws are a modified pair of legs and are the first pair, immediately under the head. These venomous claws can sting its victims. They are so dangerous that these formidable predators can even bite and feed on average sized snakes, although their favourite prey is mice and lizards. The long end legs are often spiny and are waved as a threat when frightened. They are fast moving if disturbed and their scores of legs running, is stuff made of nightmares! These enormous centipedes range in colour from orange-yellow to dark blue-green-brown. They can be found in hiding in sheltered places such as leaf litter, logs, bark and soil. They usually attack when disturbed or handled. The venomous bite is extremely painful and can last for days. The pain can be eased with icepacks and painkillers. It is important to disinfect the punctured area. 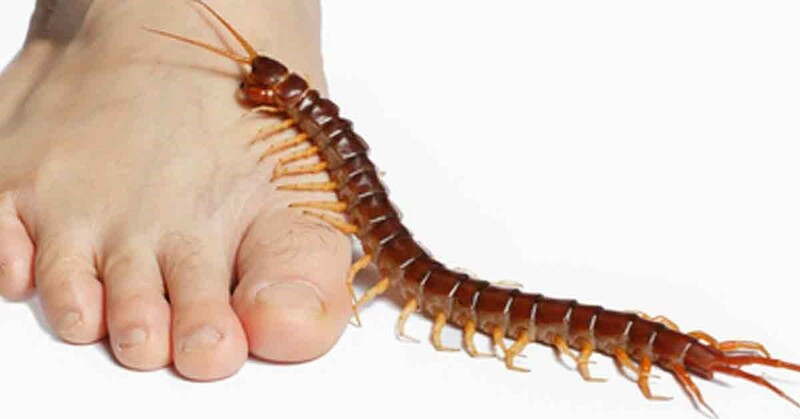 Whilst there are no records of fatalities from Giant Centipedes, adventurers should still avoid contact with these creatures. Victims without anti-tetanus injections within the past ten years should seek medical attention. • Always wear gloves when moving logs. • Dodge the strike or dash to the side of it, attacking the sides to do some damage, as it should run away. • Be careful as the Giant Centipede can turn its upper torso 180 degrees, so if it attempts to strike, hit it on the head too! Strike scorpions are common throughout Australia. They have pincer like claws and have an elongated abdomen with a sting on the end. There are many different species, with the most venomous located in the Northern Territory. The smallest scorpions are likely to be the most venomous. 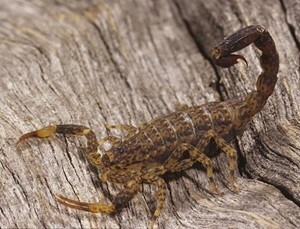 Mottled scorpions are tiny and brownish-yellow, and are members of the Buthidea family. 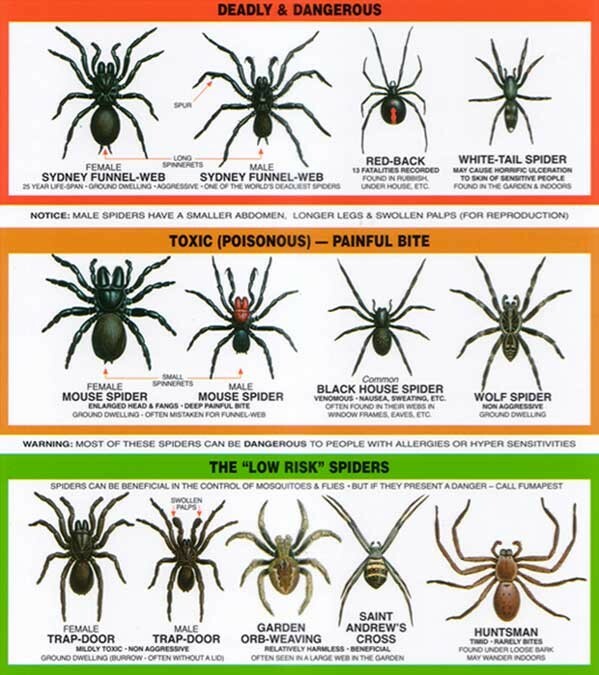 Some of these are often highly venomous and can deliver a very painful sting. Desert scorpions are large and aggressive to humans, if provoked. They are often up to 12cm long, despite their size their venom is weaker than Buthidea scorpions. Australian scorpions can give a painful sting which can cause inflammation and pain for several hours. First aid is to apply a cold pack, then use painkillers. It is important to disinfect the punctured area and seek medical attention if the pain persists. Victims without anti-tetanus injections within the past 10 years should see a doctor. There is the potential that an allergic reaction may cause death or severe illness, especially for the elderly and young children. • Wear good gloves and shoes if moving garbage and cleaning up materials in camp site. • Shake out and examine clothes and bedsheets. • Keep a watch out near watering holes as scorpions like water. Cassowaries have the reputation of being the most dangerous bird in the world. They get cranky if they are approached and swiftly karate kick whoever approaches them with their powerful legs. These bad tempered birds are strong and swift to act striking out with razor sharp claws. Growing up to 1.5-2 metres high, they are the third largest bird in the world after the Ostrich and the Emu. They can run at speeds of up to 31mph, jump to heights of 5ft and are superb swimmers, so you will never be able to easily get away from them. As descendants from dinosaurs they have a large black feathered body and bluish skin on their head, reddish skin on their neck with a blue-grey coloured legs. They are quite shy creatures and would much rather avoid confrontation. 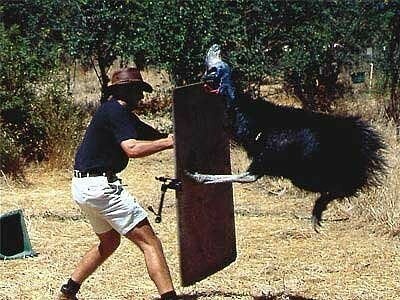 More often than not the main reason for attacking is self-defence when people try to get too close, causing the Cassowary to feel threatened. Their territorial defence of striking out with their powerful legs results in people being kicked, pecked, pushed, charged at, head butted and jumped on. Their middle claw is 12cm in length and acts as a dagger, which can result in serious bodily harm. These birds attack hundreds of people every year, and have even killed before. Turkeys are such feeble birds compared to their Australian cousins! • Do not feed them. • Do not get too close. • Keep pet dogs well away. • Female kangaroos are carrying a ‘joey’ in their pouch, or are on guard when their offspring are learning to live outside the pouch. 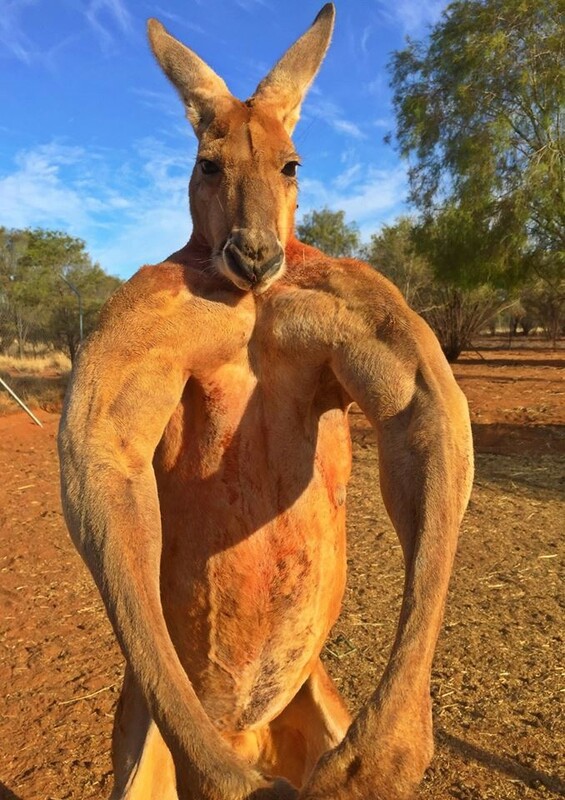 • When males kangaroos are fighting for possession of a female during courtship, as they can be aggressive seeing humans as a threat. • Kangaroos who are used to people feeding them and come to expect food, get bad tempered when they do not get it. • When there is a drought conditions, bringing them into towns where there is green grass and water. • When predators, such as dogs approach. • When they are cornered or feel threatened, or scared by accident. Kangaroos can deliver powerful kicks whilst supporting themselves with their tails. They are strong and will use their killer claws on their arms to try and gouge the eyes out of the challenger. They have an even larger sharp claw on the end of their mighty feet that can easily slice open a human abdomen with one kick. • Do not walk quickly towards a kangaroo, especially if they are in a group, get a bush or a tree between you. • If one moves towards do not run, but walk away sideways to protect your organs. • Protect your face by raising your hands and leaning your head away. • Crouch down, avoid eye contact and back away. • Curl yourself in a ball with your back facing the kangaroo and slowly crawl away. • Let out a short low grunt, even though it is embarrassing, as that is how kangaroos acknowledge inferiority to a more powerful male. Amazingly Australia is home to the largest number of feral camels in the world. They were brought here in the 1840’s from India and Afghanistan to assist the exploration of inland Australia. They were used to carry heavy loads and work in remote places, and they have since made it their territory. Formally domesticated they have since turned wild and it is now estimated that up to a million camels now roam freely in the Outback today. As feral camels they are causing many problems to farmers and other Australian animals. They can drink up to fifty gallons of water in minutes, consequently waterholes can dry up quickly. They damage property by running over fences, toilet systems and breaking pumps. They destroy trees and eat up leaves and grass. However, as the numbers increase, especially during droughts camels can become desperate in their search for water. Thousands have been known to invade small towns, smash roads, and bring down homes. Children have been in danger of being trampled. Some people have become so frightened that they do not leave their homes when large numbers appear. Despite being intelligent animals. If handled badly they can be quite dangerous and have an obstinately uncooperative attitude towards being tamed. They can be ill-tempered, stupid, stubborn, and capable of holding a grudge. If a camel is injured they can bite and kick and even spit green saliva! • Do not corner or frighten wild camels. • If they become cranky and approach you run sideways! • Try and put a fence of a tree between you and the camel until they lose interest. You would not want to meet a feral pig in the bush! They have large tusks which are extremely dangerous as they attack. They have solid bodies and can weigh up to 175kg, making their charge deadly if you provoke them. If someone scares a pig, they would charge straight to them and you can imagine what four extremely sharp tusks of up to 5 inches would do to them! Pet dogs should not chase them either! While direct conflict with humans is not commonplace, they are breeding rapidly with a litter of up to six piglets twice a year. In favourable conditions it is estimated there are more feral pigs than farmed cattle in Australia! This population explosion means that as human and pig territories merge, the risk of direct conflict will increase. 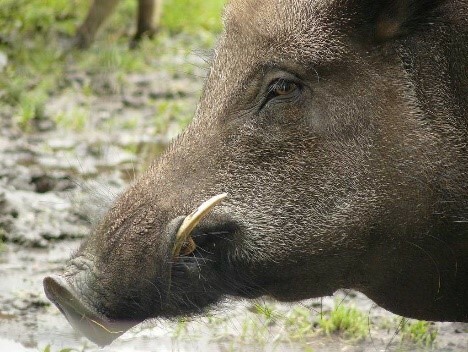 However feral pigs have a great sense of hearing and smell and will generally avoid contact with humans. The feral pigs are having a big impact on farming, especially on lambing, as they take little lambs. When it is really dry they will kill full grown sheep. They have no natural predators and can uproot and destroy land causing crop damage and contaminating water sources with their wallowing, rooting and defecation. In many parts of the country, pigs carry diseases, such as tuberculosis and leptospirosis. Alarmingly, if diseases like foot and mouth should enter Australia, feral pigs are predicted to spread it widely! • Keep well back if one is encountered, especially if piglets are present. • You can try and side strep very quickly to avoid the swing of its tusks. • Try to remain standing if attacked as people who are knocked to the ground or fall can sustain more serious injuries. • Be aware that feral pigs are most active when feeding at dawn or dusk. • Keep pet dogs on a lead!